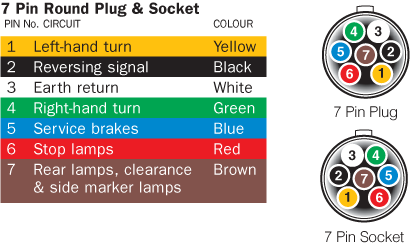 Here’s the wiring diagrams showing the pin out for the plug and socket for the most common circle and rectangle trailer connections in use in Australia. I put this here because I had a hard time finding and figuring this out for my trailers. If you have a round connector, commiserations. Get a flat one. Why? Well first of all, which round one? There are at least 3 different 7 pin round connectors in use in Australia right now. Queensland prefers the small 7 pin round, and apparently Victorians prefer a large 7 pin round that has a completely different pinout! There is also a heavy duty 7 pin round, which is different again! Why? Oh Why? And you can chuck in a couple of older 5 and 6 pin round connectors as well just to make it more confusing (I’m not sure if they are still in use, so I haven’t bothered with them here). Plus to top it all off, sometimes the small 7 pin round is rotated so that the yellow pin is at the top! On the other hand, flat connectors have only one possible pinout in Australia, one possible orientation (they aren’t half rotated), and the extended 12 pin version is even compatible with the 7 pin one. So every rectangular connector in Australia is compatible! And in my personal experience the flat is more reliable. I used a small 7 pin round for 10 years, and then after replacing the plug multiple times changed to 7 pin flat for the last 12 years, and I have never had a problem with a flat connector. I had one vehicle with a 12 pin socket and a trailer with a 7 pin connector and they played happily for years. Why is it more reliable? I think part of it is that the flat connector has the female part (the part you need to protect most) covered and attached to the vehicle, whereas the 7 pin round connector has the female socket as the plug on the trailer. I don’t have the luxury of keeping my trailers in a garage – they are out in the elements – which is great if you like providing homes for bugs. I can’t count the number of times I had to remove critters from the female 7 pin round connector on the trailer end. Not so with the male 7 pin flat. It might just be me, but I also think it makes more sense to have the socket powered rather than the plug (just like household 240v sockets – imagine if they were 240v prongs sticking out of your walls at home that were live). It’s hard to short out a powered socket as you need two conducting prongs, whereas shorting out a powered plug is simply a matter of touching two of the prongs with something conductive (like a screwdriver, finger, etc). So if you have the choice, go flat! For years in Queensland the small 7 pin round was the most common, but recently I bought a car and immediately had the round socket changed to a flat one, and the towbar place who fitted it said that flat was now more common – a change that had just occurred in the last few years. This is an extension of the 7 pin flat. The 7 pin flat plug will fit into a 12 pin flat socket and work perfectly. Identifying: Plug size is similar to an Australian 10c coin. There is a noticeably larger gap between 1 and 6 on this plug, though some trailer places rotate this connector that the yellow is at the top. Socket and plug are keyed. Identifying: Plug size is similar to an Australian 20c coin. Pins evenly spaced. Socket and plug are keyed. Identifying: Plug size is similar to an Australian 50c coin. Earth is bigger pin. No key (other than oversized earth pin) on the socket or plug. Brilliant sorted my problems out in one !! 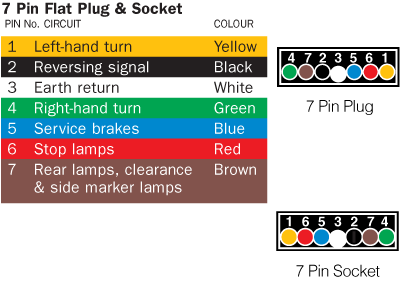 Could you please give me the old ( 1980’s ) wiring harness colours as the currant one has differs colours the one that I have now is the standard yellow,black,white,green,blue,red, and brown. There are different colours than I have. Some have striping and some colours are just not there. I would like your help in this matter! hi, we seem to be losing a lot of voltage from the plug to the e-brakes. Could the wires be too thin? Any thoughts? Yep, that seems the most likely cause. Brakes need a lot of power. Run a separate cable – 4mm seems to be the recommended size, 6mm if running a long way. I have 7 pin round. When I plug new van into vehicle, vehicle reverse lights and Auto indicator (R) lights come on. Even when vehicle is in park. Sounds like a miswiring or a short. I’d replace the plug on the van side for starters. Question toon went to change from round to flat in Victoria today as the new car has flat connector on the back of it. Bought two narva 7 pin connectors to wire up to the trailer and a bike carrier. Found the bike carrier had its wires soldered to clips so decided not to play with it for now and just tested it with an adaptor I had from round to flat. All lights worked fine, brake, rear lights and indicators and discovered when you unplug the connector from the car with the car locked alarm goes off. It’s an Amarok if that makes any difference for below. When I tried to reword the flat connector to the jet ski trailer I can get everything to work but the brake lights. I only have 5 wires as no reversing and I assume no service brakes as I a, making the assumption that is electric brakes which I don’t have. I tried the wire in both and I can’t get the brake lights to come on. I haven’t had time to try the bike carrier again since I did this to test I haven’t blown a fuse. Any ideas as I have read on the net there seems to be some issues with Amarok and trailer wiring so not sure if it’s me or the car. Perhaps the alarm going off is intended? To alert you if someone is trying to steal your trailer? In any case, with an alarm to complicate matters, I think I’d be going to an auto electrician to sort all that out. I recommend you state that the diagrams are cable side view. Excellent point. I have updated the article. Much appreciated. Thank you! I have five colours on the main trailer cable yellow white green brown and red. Thanks so much! After a lot of searching I finally this this article which clearly lays out what I went to know! Spectacular post for every state. Well done. Totally agree – go flat! 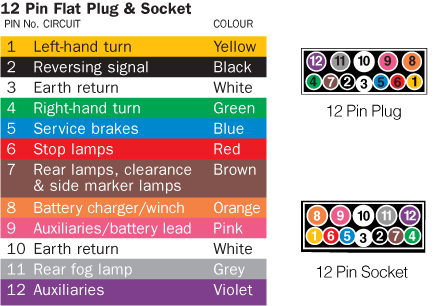 Here in WA the most common plug is the medium sized round 7 pin and the flat type is known as the Eastern States Plug. However, I use an adapter for flat to round when my trailer gets loaned out to a car with round socket. 30 years ago the WA type was 6 pin round and I have even seen setups using 3 pin mains plugs on the trailer and sockets on the car making 6 connections! Could someone please tell me which pin is used for the power circuit. Daniel, thanks for the information. This is very helpful after spending an hour and a half on trying to sort it out. Should have look for something like this before hand. I totally disagree. 7 pin flat plugs are the most useless piece of plastic out – always breaking. Small seven pin round METAL plugs for me. just taking a flat plug off the vehicle to replace it with the round. now wondering why I have an extra 2 wires in the lume that go to the outer sides of the flat plug. there is no outlet for them to plug into. Hi Mick! First of all I’d stay with the flat connector, but that’s just me. If they aren’t connected, I’m guessing the extra wires are for Auxiliaries or Fog lamp or similar which is part of the 12 pin flat – even though you had a 7 pin flat the wiring loom may have included these in case you ever wanted to go to a 12 pin flat. That’s my guess, but I’m no auto electrician. If they weren’t connected I’d just make sure they are well insulated with electrical tape so they don’t short on anything. If they were connected to any metal housing they might be an extra earth return – you can check this by checking the resistance between the earth return (white) and the spare leads. Low resistance = another earth return. High (or infinite) resistance = not earth return. If not an earth return, tape up well and ignore them. Or check with someone who knows what they are talking about instead of me 🙂 I found a local towbar fitting place that fits new trailer plugs to cars for $20. The extra wires are so that when the trailer is disconnected the load for the flasher unit remains unchanged. Outstanding post it is definitely. My teacher has been searching for this update. Grrrrrrr, found this picture after ripping of the whole round plug. Found the indicators are swapped and shorts out the brake lights. After blowing 3 fuses decided to limp back home to sort it later. Guess what, the image of the round plugs has been rotated about 150 degrees: yellow should point up. Well, I just learned something new. Apparently there is another 7 pin round – a large one that is common in Victoria, with a completely different pinout. Why did they do that? I’m in Brisbane. Also sometimes the small 7 pin round is rotated so that yellow is on top. 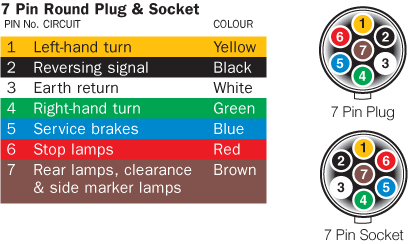 Not sure which is your case – if the indicators are swapped it sounds like the large plug. I’ve altered the article and added the large round connector so others don’t have this problem. Thanks for letting me know, and sorry.